The first commercial moving walkway in the United States was installed in 1954 in Jersey City, NJ, inside the Hudson & Manhattan Railroad Erie station at the Pavonia Terminal. Named the "Speedwalk" and built by Goodyear, it was 84.5 meters (277 feet) long and moved up a 10 percent grade at a speed of 2.4 km/h (1.5 mph). The walkway was removed a few years later when traffic patterns at the station changed. 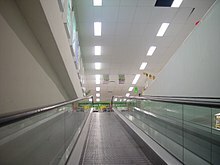 Pallet type – a continuous series of flat metal plates join together to form a walkway – and are effectively identical to escalators in their construction. Most have a metal surface, though some models have a rubber surface for extra traction. The plates are one-piece, die-cast aluminium pallets, with a typical width between the walkway sides of 800–1,200 millimeters (31–47 inches). The walkway can be powered by an AC induction motor. Example speed is 0.5 metres per second (1.6 feet per second). Moving belt – these are generally built with mesh metal belts or rubber walking surfaces over metal rollers. The walking surface may have a solid feel or a "bouncy" feel. The entrance to the system was like a very wide escalator, with broad metal tread plates of a parallelogram shape. After a short distance the tread plates were accelerated to one side, sliding past one another to form progressively into a narrower but faster-moving track which travelled at almost a right angle to the entry section. The passenger was accelerated through a parabolic path to a maximum design speed 15 km/h (9 mph). The experience was unfamiliar to passengers, who needed to understand how to use the system to be able to do so safely. Developing a moving hand-rail for the system presented a challenge, also solved by the Battelle team. The Speedaway was intended to be used as a stand-alone system over short distances or to form acceleration and deceleration units providing entry and exit means for a parallel conventional (but fast-running) Starglide walkway which covered longer distances. The system was still in development in 1975 but never went into commercial production. 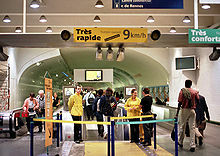 Another attempt at an accelerated walkway in the 1980s was the TRAX (Trottoir Roulant Accéléré), which was developed by Dassault and RATP and whose prototype was installed at Invalides station in Paris. The speed at entry and exit was 3 km/h (1.9 mph), while the maximum speed was 15 km/h (9.3 mph). It was a technical failure due to its complexity, and was never commercially exploited. 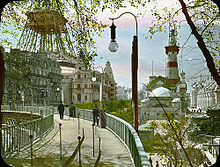 In 2002, CNIM designed and installed the experimental, 185-metre (607 ft) trottoir roulant rapide high-speed walkway in the Montparnasse–Bienvenüe station in France. At first it operated at a speed of 12 km/h (7.5 mph) but was later reduced to 9 km/h (5.6 mph) due to safety concerns. As the design of the walkway requires riders to have at least one hand free to hold the handrail, those carrying bags, shopping, etc., or who are infirm or physically disabled, must use the ordinary walkway beside it, and staff were positioned at each end to determine who could and who could not use it. Using this walkway is similar to using any other moving walkway, except that there are special procedures to follow when entering or exiting at either end. On entering, there is a 10-metre (33 ft) acceleration zone where the "ground" is a series of metal rollers. Riders stand still with both feet on these rollers and use one hand to hold the handrail and let it pull them so that they glide over the rollers. 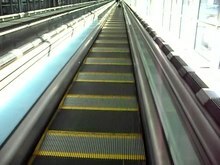 The idea is to accelerate the riders so that they will be traveling fast enough to step onto the moving walkway belt. Riders who try to walk on these rollers are at significant risk of falling over. Once on the walkway, riders can stand or walk as on an ordinary moving walkway. At the exit, the same technique is used to decelerate the riders. Users step onto a series of rollers which decelerate them slowly, rather than the abrupt halt which would otherwise take place. Video of the "ThyssenKrupp Express Walkway"
The walkway's pallet-type design accelerates and decelerates users in a manner that eliminates many of the safety risks generated by the moving belt-type used in Paris, making it suitable for use by people of all ages and sizes regardless of their health condition. The pallets "intermesh" with a comb and slot arrangement. They expand out of each other when speeding up, and compress into each other when slowing down. The handrails work in a similar manner, and because of this, there is no need to hold the handrails when entering or exiting the walkway. It moves at roughly 2 km/h (1.2 mph) when riders step onto it and speeds up to approximately 7 km/h (4.3 mph), which it remains at until near the end, where it slows back down. as access to a parking facility or a ground transport station. to make sure the crowd moves through at a reliable pace. The 1975–76 American Freedom Train did this with a moving walkway inside each successive railroad car, thus maximizing the number of people who could view the interior exhibits in the limited time the train was stopped in each town. the Ultra Twister, a roller coaster at the now closed Astroworld in Houston, Texas had a moving walkway with no handrail for passengers to step on prior to boarding their car. The walkway would move at the same speed as the approaching cars, allowing passengers completing the ride to step off and for boarding passengers to enter the car. An announcement played "Moving conveyor, please watch your step" to warn of the moving walkway. the exit from the Space Mountain attraction at Walt Disney World Resort formerly had a long moving walkway which changed inclination multiple times. As of November 15, 2018, it has been converted to conventional flooring. the exit from the Pirates of the Caribbean attraction at Walt Disney World has an inclined moving walkway leading towards a gift shop. In each of these cases, there is a massive network of parallel moving belts, the inner ones moving faster. Passengers are screened from wind, and there are chairs and even shops on the belt. In the Heinlein work the fast lane runs at 160 km/h (100 mph), and the first "mechanical road" was built in 1960 between Cincinnati and Cleveland. The relative speed of two adjacent belts is 8.0 km/h (5 mph) (in the book, the fast lane stops while the second lane keeps running at 153 km/h (95 mph)). In the Wells and Asimov works there are more steps in the speed scale and the speeds are less extreme. They were imagined by science fiction writer H. G. Wells in When the Sleeper Wakes. Robert A. Heinlein made them the instruments of social upheaval in the 1940 short story The Roads Must Roll. Isaac Asimov, in his Robot series, imagined slidewalks as the potential method of transportation of practically the entire urban population on Earth, with expressways moving at up to 95 km/h (60 mph) equipped with seating accommodations for long distance travel, and with slower subsidiary tracks branching off from the main lines. Arthur C. Clarke also used them in The City and the Stars. Larry Niven used them in Ringworld and Flatlander. Slidewalks figure prominently in the animated series "The Jetsons". ^ "KONE escalators and autowalks for new buildings". KONE. Retrieved 2018-06-13. ^ "moving sidewalk | Definition of moving sidewalk in US English by Oxford Dictionaries". Oxford Dictionaries | English. Retrieved 2019-02-07. ^ "moving pavement | Definition of moving pavement in English by Oxford Dictionaries". Oxford Dictionaries | English. Retrieved 2019-02-07. ^ "Collins [British] English dictionary". William Collins and Sons Co. Ltd. Retrieved 15 July 2015. ^ "travelator – definition of travelator in English from the Oxford dictionary". oxforddictionaries.com. ^ "the definition of moving walkway". reference.com. ^ Bolotin, Norman, and Christine Laing. The World's Columbian Exposition: the Chicago World's Fair of 1893. Chicago: University of Illinois Press, 2002. ^ Ellis, Ian. "Moving Sidewalks". Todayinsci. Retrieved August 30, 2013. ^ Alleyne, Richard (16 July 2009). "Using the airport moving walkways 'actually slows you down'". The Daily Telegraph. Retrieved 5 April 2016. ^ Otis Elevator Company, "NCT Trav-O-Lator Moving Walk," Farmington, CT, 2000: 1. ^ Rowlands, David (1 May 1972). "Dunlop's easy rider". Design 1972 Journal (281): 76–79. Retrieved 11 May 2015. ^ Le trottoir roulant rapide de Montparnasse va disparaitre », sur tf1.fr, 21 mai 2009. ^ Bryant, Chris (22 October 2014). "ThyssenKrupp aims to accelerate travelators beyond the pedestrian". The Financial Times. Retrieved 1 February 2016. ^ "Customers With Disabilities Policy". Walmart.ca. Wal-Mart Canada Corp. Retrieved 4 April 2016. ^ Figueroa, Jessica (2018-11-16). "PHOTOS, VIDEO: New Space Mountain Exit Opens, Speedramps Removed..." WDW News Today. Retrieved 2018-11-16. ^ "STATEMENT OF REASONS Compulsory Purchase Order 2013" (PDF). Cyngor Sir Cyngor Sir Ceredigion County Council. ^ "Lanterns, Tesco, Silver Band and Fantastic Beasts - A Simple Life of Luxury". www.alananna.co.uk. Retrieved 2017-03-10. ^ Heinlein, Robert A., "The Roads Must Roll," in Healy, Raymond J. and J. Francis McComas, ed., Famous Science Fiction Stories: Adventures in Time and Space, 2nd ed. New York, Random House, 1957. Smart Links – Website for professionals working with short distance automated transport.